Posted in red devils with tags cross your heart, king king, lester butler, mp3, red devils, remix, trip-hop on July 27, 2009 by J.J.
On the hunt for more Red Devils info, stumbled onto the forum for The Gretsch Pages. There, member tidalwave_sideburns has uploaded a trip-hop blues track with vocal samples from Muddy Waters and Lester Butler from “King King” (can you pick which ones?). In addition, “Cross Your Heart” is used as a bluesy bed for the cut. It’s certainly different — and actually quite cool. Give a listen to the MP3 “Oh Yeah Baby” right here. Posted in red devils with tags cleveland, cleveland plain dealer, gig, jane scott, red devils, review on July 22, 2009 by J.J.
Two great articles in the Cleveland Plain Dealer in October 1992 give more history of the Red Devils (winning 1992 Best Blues Band at the Los Angeles Music Awards) along with a review of a live gig at Peabody’s DownUnder in The Flats Oct. 15. Both articles come courtesy of reporter Jane Scott, who has her own interesting history. Born in 1919, she was known as “The World’s Oldest Rock Critic,” working in the hometown of the Rock and Roll Hall of Fame. According to the Plain Dealer, she covered everyone from The Beatles all the way to Nirvana before retiring in 2002. For the Devils to be the subject of the 70-something Scott’s writing — not once, but twice — may demonstrate their status and potential in late ’92. Check out the level of detail here, especially in the review — this woman knows her Devils! She doesn’t slack off, even when reviewing a bar band. CLEVELAND — It happened unexpectedly in a converted Chinese restaurant in Los Angeles called the King King, a a tiny, smoke-filled club with a 12-by-15-foot stage and a battered old upright piano. The Red Devils fire up Peabody's DownUnder Thursday. The Monday night regulars there, the bluesy Red Devils band, spotted a familiar figure standing in back. He seemed to be enjoying himself, bassist Jonny Ray Bartel remembered. Suddenly the man moved up to the stage, jumped up and sang Bo Diddley’s “Who Do You Love” with the band. Posted in red devils with tags andrew dice clay, blues, cassette, def american, four horsemen, jayhawks, louisiana blues, mp3, muddy waters, promo, rare, red devils, sir mix-a-lot, slayer, wolfsbane on July 13, 2009 by J.J.
After years of myths, faded memories, lost opportunities and cold trails, the rarest of Red Devils recordings is discovered, recasting the band as a semi-acoustic traditional blues combo. Even after the package arrived in the mail, it was still hard to believe the search was over. In our hands was the much-rumored “Louisiana Blues” promo tape. It existed and was ready to be played. “Louisiana Blues” is the alpha and omega of The Red Devils’ legend: It is both the first cut released on Def American in the early ’90s, as well as the last remaining musical mystery in the band’s official discography. 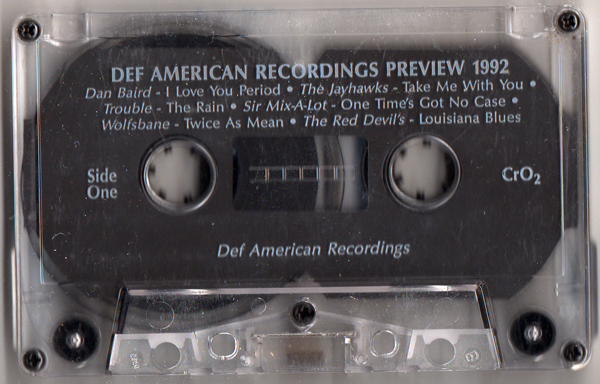 Twelve years of Internet queries, e-mails with friends and collectors and several wild goose chases had finally lead to prize: The cassette turned up in Nebraska as a listing on discogs.com before coming to nofightin.com. Posted in red devils with tags king king, lester butler, lyrics, no fightin', red devils on July 9, 2009 by J.J.
Posted in bill bateman, related music with tags bill bateman, blasters, dave alvin, john bazz, knitters, phil alvin, trouble bound on July 7, 2009 by J.J. The California blues/roots/rockabilly/R&B collective The Blasters should be required listening for any fan of American Music. During the 1980s, the band, along with contemporaries such as X and Los Lobos, bridged punk and roots music with an energy and enthusiasm that thrilled a legion of fans of all types of music. 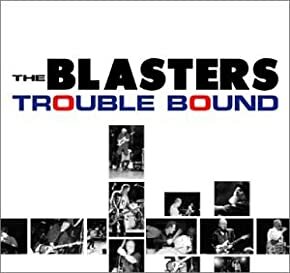 That Blasters ethic is well-displayed on the 2002 “comeback” album “Trouble Bound,” a live disc featuring the four original Blasters on record for the first time 17 years: Phil Alvin, Dave Alvin, John Bazz and Bill Bateman. The Red Devils were one of many offshoots from The Blasters, sharing at least half a dozen musicians over the two bands along with 13, the Blue Shadows, the Knitters and others. Devils fans will find much to love on “Trouble Bound,” along with some familiar touchstones: An edgy live sound, an exemplary cover of “I Wish You Would,” the wonderful Gene Taylor on keys, as well as the Blasters’ classic “Blue Shadows,” the song that ostensibly gave the Red Devils their original name. You are currently browsing the No Fightin': The Red Devils, Lester Butler & California blues, rock and roots music blog archives for July, 2009.